Today’s task: a picture of someone/something that has the biggest impact on you. I actually thought quite a bit about that. Obvious answers would probably have been: My parents (and their way of upbringing me), Diane, my/our friends, my work, our move to the other end of the world and some other things. I think all of those would have been totally valid ideas. I decided to go with someone different for day 7 though. The person I chose is my maths teacher in years 5 and 6 (which are the first two years in high school in Germany, you’d roughly be 10-12 years old). His name is Stefan Kottwitz and he managed to ignite my interest in maths and logic, in solving puzzles and in solving problems in a logical way at a young age. Even better was that he became my maths teacher again in years 11 to 13 for the advanced maths classes (in the German A-levels system you have to pick two subjects as advanced/major subjects – no one would be surprised to learn that mine were maths and physics, would you?). I actually think that those three years had even more impact on my decision to undertake my maths degree and due to some very weird and probably lucky circumstances to end up right here and right now in Wellington, doing what I do. Some other memories include an awesome one-week sailing trip with said advances maths course to Holland in year 12, lots of games of the traditional card game “Doppelkopf” in the breaks between the lesson and him being one of the first teachers we were allowed to approach using the informal “Du” instead of “Sie” (the German language and culture is very clear and strict on when and how to use the formal vs. the informal equivalent of the English “you”). The latter was particularly an honour because his teaching style was at the time perceived by some people as quite strict. I actually never felt about it that way. I always thought – and still think – he is absolutely fair to everyone, the marks one got absolutely reflected one’s skills – as it should be. He’s also a magician doing awesome tricks with all sorts of stuff! And after all the writing, here’s the photo. It shows us in year 5 – first year of high school. I guess it’s quite obvious that he’s the happy, smiling guy on the left side of the photo :). This photo was taken in 1985 – maybe in early 1986. To make things a bit more interesting, here are some tasks for the readers – use the full size photo for it. 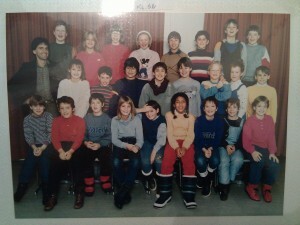 Strange, I think our class (5a) looked EXACTLY the same! I think each and every year 5 in the 80s in Germany must have looked very similar 🙂 Did you spot me? Marcus, what the hell does C3 mean 🙂 ? Is C top or bottom rom? And the 3 would be from left to right I suppose? @kai: excel-style, a1 is top left, so i guess you’re the one with the “match”-shirt. Front row; dark blue top; 3rd from the right.